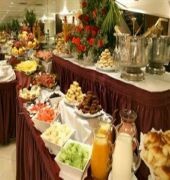 Dolmen Hotel's restaurant serves breakfast, lunch, and dinner. A poolside bar and a bar/lounge are open for drinks. Room service is available 24 hours a day. The hotel serves a complimentary breakfast. Recreational amenities include an indoor pool, a health club, a sauna, and a fitness facility. This 3.5 star property has a 24 hour business center and offers small meeting rooms, audio visual equipment, and business services. Complimentary wireless Internet access is available in public areas. 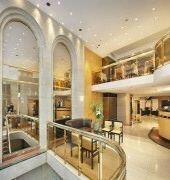 This Buenos Aires property has event space consisting of banquet facilities and conference/meeting rooms. Wedding services, tour/ticket assistance, and tour assistance are available. Guest parking is limited, and available on a limited first come, first served basis (surcharge). Additional property amenities include a concierge desk, multilingual staff, and laundry facilities. 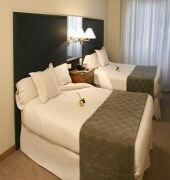 This is a smoke free property.145 air conditioned guestrooms at Dolmen Hotel feature minibars and safes. Accommodations offer city views. Bathrooms feature shower/tub combinations, bidets, complimentary toiletries, and hair dryers. Wireless Internet access is complimentary. In addition to desks and complimentary newspapers, guestrooms offer direct dial phones. 32 inch LCD televisions have satellite channels. 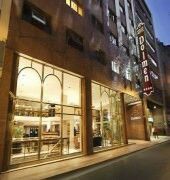 Housekeeping is offered daily and guests may request wake up calls.Dolmen Hotel is located in central Buenos Aires, close to Plaza Libertad, Teatro Colon, and Obelisco. Nearby points of interest also include Plaza San Martin and Torre de los Ingleses.